We’ve all heard tales of how the U.S. economy continues to remain stagnant, and while you may feel helpless to do anything about it, did you know one of the best ways you can help the situation is by junking that old car you’ve had lying around for years? That’s right—selling your junk car not only means you’ll get cash quickly, but it’s also great for the economy. Junking just one car has been shown to save up to 2,500 pounds of iron, 1,400 pounds of coal and 120 pounds of limestone. In addition to providing those raw materials which can be used for industrial manufacturing, when a car is recycled there is a 90% savings in raw materials, when compared to mining for these items, and a 75% savings in energy. How does this add up to helping the economy you may ask? It’s shocking, but the junk car industry is responsible for a contribution of more than $65 billion into the U.S. economy. Just by selling your clunker that you’ve had littering your yard forever, you’re making a huge impact on the economy. If you’re interested in receiving an estimate for your clunker, contact Junk My Car Queens at 718-297-9797. We service areas throughout Queens and NYC, and we have a reputation for providing top dollar for junk cars. 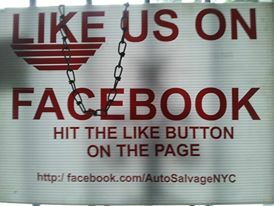 Also, follow us on Facebook and Twitter for access to all of our great deals and company updates.